A woman and child had to be freed from the wreckage of the crash on Adwick Lane in Toll Bar, to which an air ambulance was called, on March 16. Thankfully, neither was believed to have been seriously injured in the smash, which happened close to a sharp bend in the road a few hundred metres from Adwick Interchange railway station. But a nearby resident, who asked not to be named, said this should act as a wake-up call that action is needed to prevent someone dying. “There have always been accidents at that corner but it seems to be getting worse, and I feel terrified driving along there,” she said. “Over the last five or six years, there’s been a crash most weeks at that spot during the winter months, including a head-on collision just before Christmas. “Someone’s going to be killed there, without a shadow of a doubt, if nothing is done. “There’s a sign and a couple of road markings warning drivers to slow down but the camber’s all wrong. Doncaster Council said safety measures, including signs and road markings, had been introduced after similar concerns were raised some years ago. 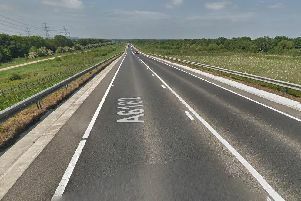 Gill Gillies, the council’s assistant director of environment, said: “According to information provided by the police, these measures have resulted in an improvement in the safety record, with no casualties reported along Adwick Lane, Toll Bar, between 2016 and 18. I am concerned to hear of a recent incident and the situation will be reviewed when further details become available.